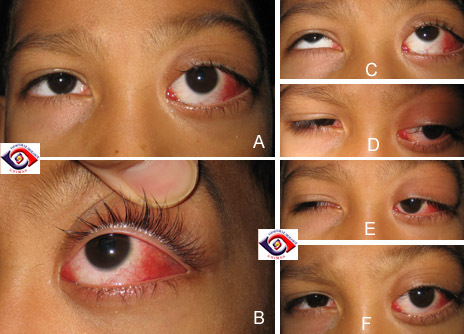 This 9-year old boy presented with a 2-year history of prominent left eye (Figure 1). Recently there had been an increase in size. His vision was normal in both eyes. 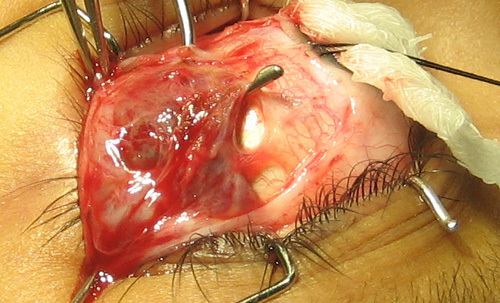 Closure of the left eye was near complete with only minimal conjunctival exposure. Orbital examination revealed a non-axial proptosis which was no reducible (Hertel's exophthalmometer at 98mm Right eye 17mm and left eye 21 mm). The lateral aspect of the globe was red with subconjunctival pigmented, raised lesions which were not tender to palpation. The proptosis did not increase in size with Valsalva maneuver. The ocular motility showed restricted left horizontal movement more with abduction than adduction. Figure 1. Left proptosis with redness of the left lateral globe in A.
Subconjunctival pigmented lesions could be seen in B.
Orbital CT scan (Figure 2) revealed a diffused orbital mass involving the left rectus muscle and the retrobulbar space. Occasional calcification was also identified within the mass. The radiologist gave a list of differential diagnosis including rhabdomyosarcoma (unlikely in view of the prolonged history). and the retrobulbar space. The lateral rectus can not be separated from the mass. A biopsy of the lateral orbital mass (Figure 3 and 4) was reported as showing capillaries lined by endothelium laden with blood consistent with haemangioma. His parents refused surgical debulking because of the risk of visual loss. Figure 3. Lobulated subconjunctival pigmented lesions. Figure 4. Pigmented lesions with fibrous tissue in the lateral aspect of the lateral rectus. The muscle was bound to the lesion by collagenous tissues. a. What is the correct diagnosis for this condition? b. What are the treatment options?